We like buildings. We collaborate with architects, other designers and artists to work on larger scale schemes or smaller details. Sometimes we design, sometimes we just make, sometimes we work together. Below are a selection of projects. An extra wide front door and matching service door and frames constructed in European Oak. A left over piece of flood risk land that was found by Stephen Davies of 31/44 following a thorough search for an affordable and suitable place to build his own home. The unusual shape is a result of the difficult plot on which the house is built: it was a leftover piece of flood-risk land at the end of a terraced row and, as such, the ground floor is set half a metre above pavement level. 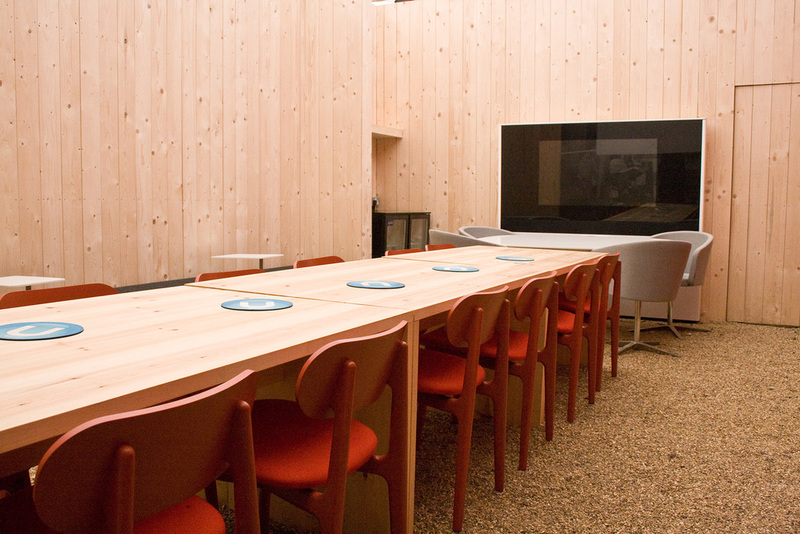 Working in collaboration with PearsonLloyd, we built a conference room, cafe environment and exhibition display. Hackney House provided a hub for media and commerce during the 2012 Olympic and Paralympic games. Built in Shoreditch High Street, it accommodated the Inward Investment and Media Centre for journalists during the games, as well as exhibitions and events throughout the summer. Tech City Investment Suite which showcases London's digital technology sector to global investors. The design allows sheet materials to pass easily through the front door. The canopy and security shutter are integrated into the frontage. Recycled laboratory worktops were used to make a substantial front door the teak matches an original shop sign. Other architectural elements also fabricated in-house included bespoke gate, signage, planters and bollards. Designed to encompass both their personalities and work, the balustrade changes from a square grid to triangles as the viewer moves through the space. Michael's architectural discipline morphs into Andrew's artistic expression. Topographic architectural models were precision cut from high density foam with our CNC mill. The site plan data was turned into three dimensional models to enable the client to understand the relationship between the landscape and the proposed scheme. The Heart of Africa Rainforest Biome will form the flagship first phase of the radical new 'Natural Vision' masterplan for Chester Zoo and transform the zoo into a world class animal and visitor experience. A bathroom door fabricated using 'readymades'. Sandblasted ashtrays were utilised as bullions.